A cold wind but warm fibre! 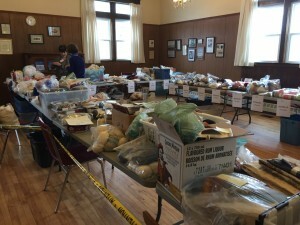 We had full house for our annual general meeting and stash stash on Saturday the 17th. A new board has been elected and details will be posted after the next regular board meeting. 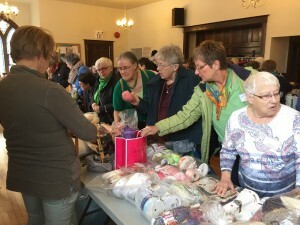 There were lots of deals to be had at the stash sale with many balls of fibre, bags of buttons and ribbons, patterns and odds and ends going home with happy new owners! A big thank you to everyone who came out. And a huge thank you to our sponsors. Remember to use your cards for discounts! Many stayed on to work on the their projects and chat and catch up. 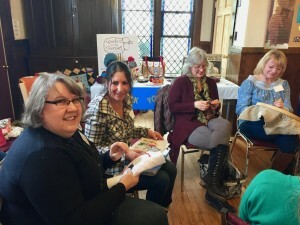 Our next event is a stitching day on Sunday, April 15th. Stay tuned for details. 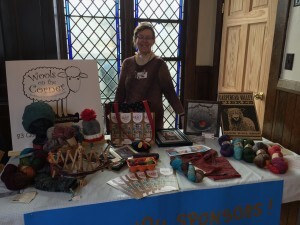 Out-going and founding president Cathy Malon staffing the Sponsor table. Tables ready and full of stash. 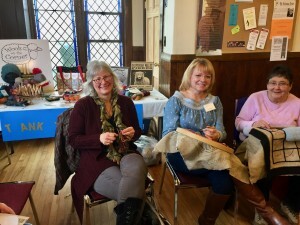 Donna, Marie and Mary working on their projects. Sisters Tammy and Teresa cross-stitching.